« Porsches ‘n’ Pancakes at The Haymaker Restaurant Co.
Back by popular demand: Porsches2Prescott 2016! If you are planning to drive to Prescott from the Phoenix area on Saturday morning, a group drive is planned, leaving at 8:00AM from The Good Egg restaurant at I-17 and Carefree Highway. If you wish to join the drive, please arrive at least 20 minutes ahead of time to check in and get driving directions, and for the mandatory drivers' meeting. If you have questions about this drive, contact Jack Aman: (602) 762-7679, concours@az.pca.org. Even if you are not registered for the Prescott event, you are encouraged to come up to see the Porsches on display on the historic Courthouse Square. With Prescott's temperatures in the low 80’s, you’ll enjoy great back-road drives over some of the twistiest roads in the state on your way to Prescott! Come Friday evening for a fun run and no-host reception. The fun run will depart the Prescott Resort and Conference Center at 5 pm, returning around 6 pm. A no-host reception will be held in the Resort’s Eagles Nest Lounge from 6 pm to 8 pm. There will be a cash bar for beer, wine, and mixed drinks. Friday evening you can explore Prescott and visit your favorite restaurant for dinner. On Saturday you will park your Porsche in the special display area at the famous Courthouse Plaza. Parking will begin at 9 am. Those that will be driving up from the valley that day will depart at 8 am from The Good Egg 34948 N North Valley Pkwy (Carefree Highway and I-17). You can visit the restaurants and shops around Whiskey Row or hang out on the Plaza. Vote for the People’s Choice Trophy! Saturday evening there will be a banquet starting at 6 pm. Our charity partner this year is the Yavapai County Food Bank (http://www.yavapaifoodbank.org/). Help us give back to those in need by bringing a food item to donate and bidding on the Silent Auction items at the Saturday Banquet. Sunday morning we'll tour Prescott Vintage Motors, one of the finest private car collections around, including: Mario Andretti’s Indy car, Formula 1 Ferrari, 1973 Porsche Carrera RS, Porsche Speedster, Porsche 930 factory slant nose, 1931 Packard and more! Coffee and pastries will be served. After the tour we'll head out toward Bagdad for some more fun driving, a photo stop and then off to home. Join us for the weekend, or, if you don’t have the time, come up Saturday morning and head back to Phoenix after dinner. Registration is now open and will be on a first come first serve basis. Space is limited so register as soon as you can. To register for this event please select your choices from below and click on the link to go to MotorsportReg.com to complete your registration and pay the appropriate fees. Don’t forget to make your room reservations separately. Information on the hotel is provided below. With each entry, the primary entrant will receive access to all activities and tours for one person/car. This will include: Display space on the Courthouse Plaza, One Saturday night banquet dinner, one event logo shirt and a logo goodie bag, and the Sunday morning tour of Prescott Vintage Auto. This fee is per car entered. The event shirts are long sleeve cotton t-shirts with the Porsches2Prescott logo on the front and the event artwork on the back with PORSCHE printed down one sleeve. Sizes are S/M/L/XL/XXL. You can purchase additional banquet dinners (including Sunday morning car collection tour and all other tours) as well as additional shirts. A participant can have more than one paid guest for dinner. There will be a cash bar for beer, wine, and mixed drinks available at the dining area. We encourage you to register early online before the May 6th closing date. Scroll down this page and click on the link under "DETAILS/RSVP and Pay for Event" to register. ****NOTE**** If you wish to receive your shirt/clothing items in your welcome packet, you must register prior to May 6th at 9:00 AM. 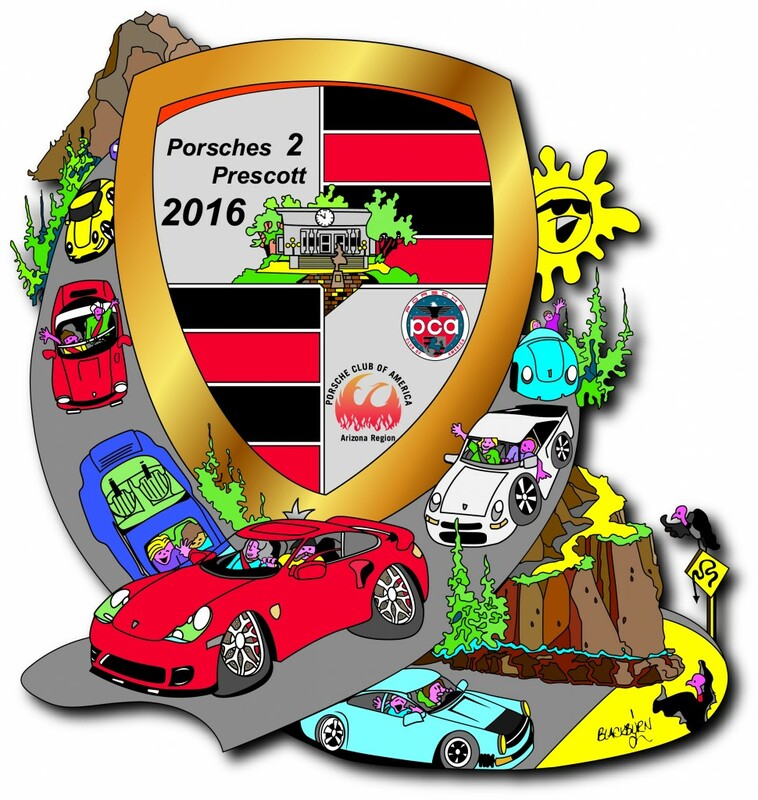 All registrations with clothing selections after that date & time will receive their items AFTER the conclusion of Porsches2Prescott. Participants will need to make their room reservations directly with the Prescott Resort & Conference Center, 1500 East State Route 69, Prescott, AZ. A block of discounted rooms has been set aside for this event. These rooms must be reserved by April 20th to receive the discounted rate, so don’t wait to make your reservations. * Plus applicable hotel taxes. Complete your personal and car information during the MotorsportReg.com login process (you can log in with the same account that you may have used previously). Select the one person package and add additional dinner or shirts. Pay for and submit your registration with a major credit card in one easy step, and you're done! We look forward to seeing you at Porsches2Prescott!